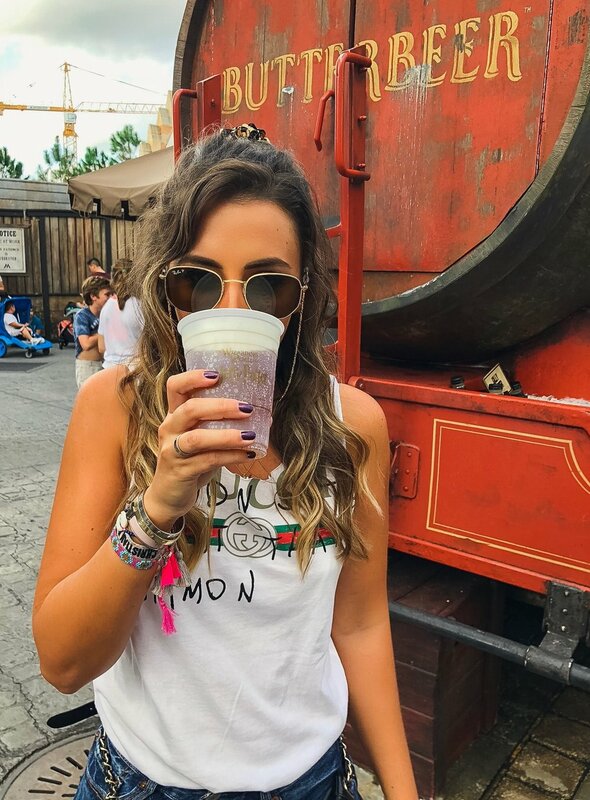 As you know I love a bit of of Orlando… I am partial to The Wizarding World of Harry Potter and all it’s treats and trinkets. I love my treats, and I couldn’t wait to get to Universal Orlando Resort to check out their new place Voodoo doughnuts! Words can’t even describe this place, but the doughnuts are absolutely out of this world. Now, I do suggest to go there around 11am, or 2pm just so that the line isn’t out of control. I tried the ‘Little Pink’, and also ‘The Loop’ as my voodoo choice, and my dad tried (I forget the name) but it was Texas related! And yes, it was BIG like Texas! The doughnut was the size of my head, see below! So before I even entered the park I had eaten about 4,000 calories, and I was about to go and eat 4,000 more calories at Florian Fortescue’s Ice Cream Parlour. The best way to do the parks, is Universal Studios first, but purchase a park hopper to Islands of Adventure. The reason I suggest the parks this way round is because the Hogwarts Express at Kings Cross is a mode of transportation to get you to the other park, if not it’s a 10-15minute walk between the parks along the water - past Toothsome Chocolate Emporium. When you first enter Universal Studios you will feel like you’ve stepped into a movie set, fake distant backdrops, with an art deco feel to the buildings. One of my favourite rides is just beyond Minions and Shrek, is Rip Ride Rockit roller coaster. If I haven’t mentioned this before on my blog, as you’re being strapped into your seat you have small screen on the lap bar with music genres and song options, you then pick your song….and rock and ride away up a steep vertical climb! The cool thing about the ride is you can document your entire thrill with the video each carriage has! However, no I didn’t purchase my ride as it was probably me at my most unattractive, hair everywhere, g-force on the cheeks! The works! What was quite cool was throughout the day they were setting up for Halloween Horror Nights, so I had a small sneak peak of what was to come for the evening. Oh also, side note…. this park closes early, in order for them to set up for the Halloween Horror Nights. Fast & Furious - Supercharged! This is the new ride that’s made quite a hit in the park! If any of you remember the park way back when, this ride has basically taken up the space where Earthquake was. This ride is a 3D experience, and if you have done King Kong, they are very similar! Same sort of big bus you ride along, action both sides of you, wind in your hair, 3d and 4d action. I wouldn’t compare it to Transformers, that’s closer to Spiderman style of ride. I thoroughly enjoyed this ride, I did think it was quite short though! But, the best bit is walking through all of the garages as you line up for the ride, and the 2 interactive rooms before - quite a lot of the cast from the movies got involved in filming snippets for the ride. After burning off probably 2% of the calories I ate at Voodoo Doughnuts I definitely thought it was time for an ice cream at Florian’s…..! I can’t resist them, but first of all you have to find Diagon Alley! For those of you who found it, or can find it - definitely wait in line for one of these amazing ice creams, they have soft serve and hard pack ice cream. This trip I decided on a soft serve, I had chocolate & vanilla mix, even though it looks a little mushy in the photo… it tasted way better than it looked! After getting my wizarding fix, and finishing up around the rest of the Universal Studios park it was time to get to Kings Cross Station to take the Hogwarts Express over to Islands of Adventure. I know it’s expensive to get a park hopper ticket however - it really is worth it, the whole train is animated and really makes you feel as if you’re riding on the Hogwarts express - the flying car, the lake, chocolate frogs! Dementors….! If you prefer to do the parks the other way round, Islands to Universal then the train also works this way too, but you don’t queue up in Kings Cross station as you do from the other park. Oh and first thing I did…. get another park treat! Butterbeer!!! As you can see in the back of this photo there’s a crane…which can only mean NEW RIDE!! There wasn’t much information on the new ride, but it’s where a dual roller coaster used to be, and so I am hoping for another coaster in place! I did peep over there but I couldn’t seem to work out what was there in place, a cathedral looking building! From Butterbeer to Jurassic world, to King Kong and Toon land! Soon it would be time for Halloween Horror nights. But first, I had to take a selfie, no I am joking - I actually got mum to snap some more pics and I had to go on every ride left of course! As well as hit my favourite one King Kong! Wow this ride, there’s something about it - it’s just so well done! Comment below if you have been on this ride and absolutely loved it too! I actually really wanted to do the Raptor Experience in Jurassic World, but the queue for this was about 2hours and there isn’t a fast pass option. This isn’t so much a ride, but an interactive experience meeting a ‘real’ raptor! But I was curious as to how they made this happen, however I didn’t have 2 hours to wait for this - unfortunately! Next time I need to meet the raptor! As the day was getting on, I did swerve the water rides… mainly because I had to go back into the park later in the evening and the thought of looking like a drowned rat for the evening onwards wasn’t that appealing! Yes, I did do an outfit change for the evening too… But I do suggest if you fancy a cool down to hop on Dudley Doo Rights RipSaw Falls, or Popeye if you want a SUPER soak! However, my Dad did find it HILARIOUS when I was posing for the photo with the toon doggies, to splash me with the water coming out of the fire hydrant. After a long day round both parks, squeezing in every single ride - with the fast passes - and park hopping, it was time to head out for a bite to eat at Hard Rock Hotel and get back out into Halloween Horror Nights.